3:30 AM The alarm goes off and it’s a relief. I’ve only slept a couple of hours and those were fitfully. My husband, John, who has been so supportive in my endeavor, is up with me and drives me to our rendezvous with Gini at the little brown church in Bigfork…and so it begins! Packing all the gear into Gini’s car. So much stuff! We drive north with Gini at the wheel. 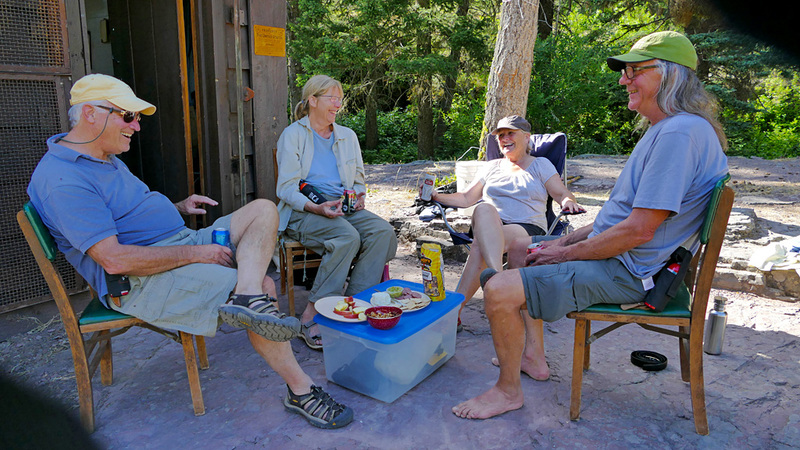 The location of our adventure is in the Great Bear Wilderness on the middle fork of the Flathead River. We approach our turnoff near Mariah’s Pass just as the first dawning light brightens the sky. The wildflowers are spectacular along the gravel road that will lead us to the trailhead. 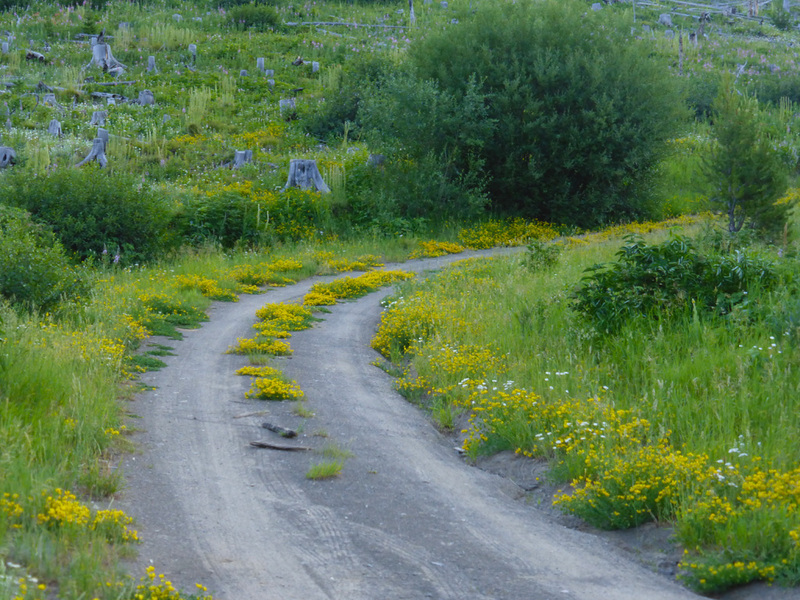 It was like driving through a parade route of wildflowers, they were so varied and abundant. 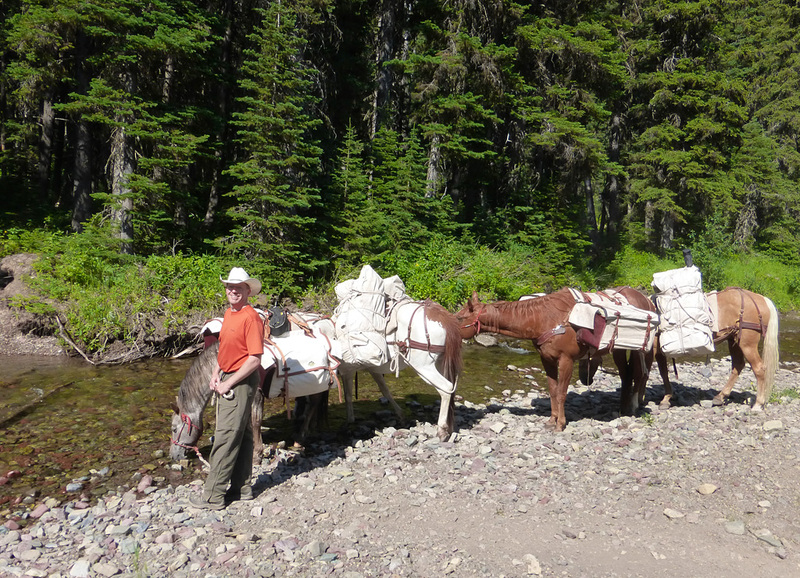 We meet our horse packer and the four horses who will be hauling in our gear. Matt Farwell has generously volunteered to make the journey along with Leroy, JC, Spunky and Happy: a chestnut Quarter Horse, a tamed Mustang from Nevada, a Paint, and an Appaloosa. Matt loading up the horses with our gear. From L to R: Spunky, Happy, Leroy, Matt, and JC. 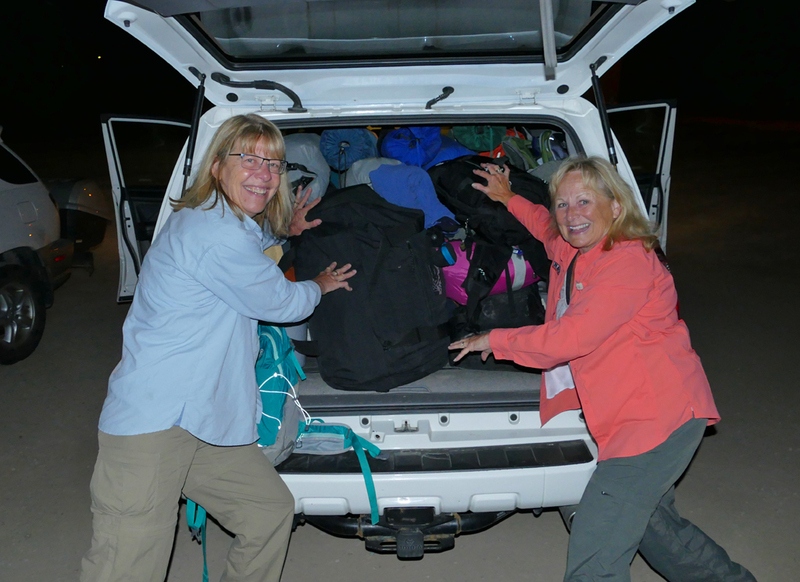 It takes about three hours to get the horse packs loaded up. 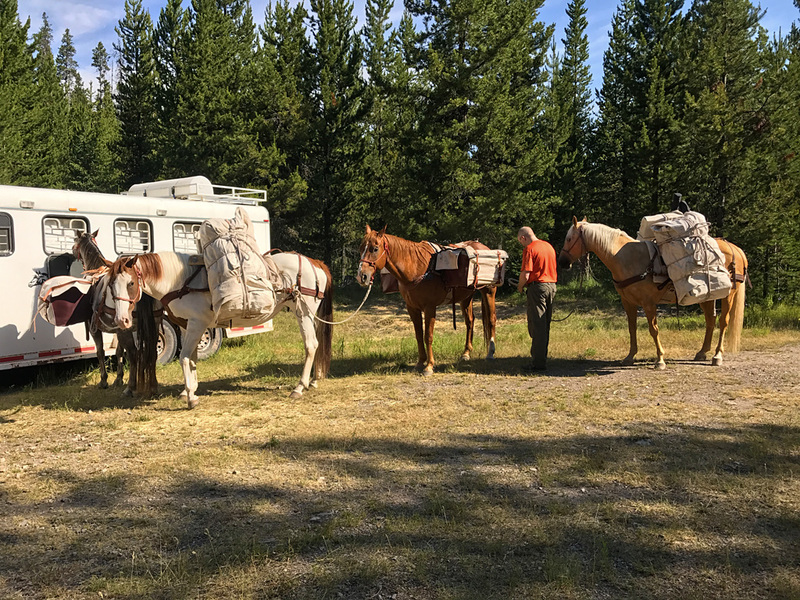 We’d hoped to have more horses when we had packed our gear but we had to cull our gear down to an acceptable weight for the four horses. Out goes half the clothes and some food. We manage to fit in 2 boxes of red wine, thankfully. 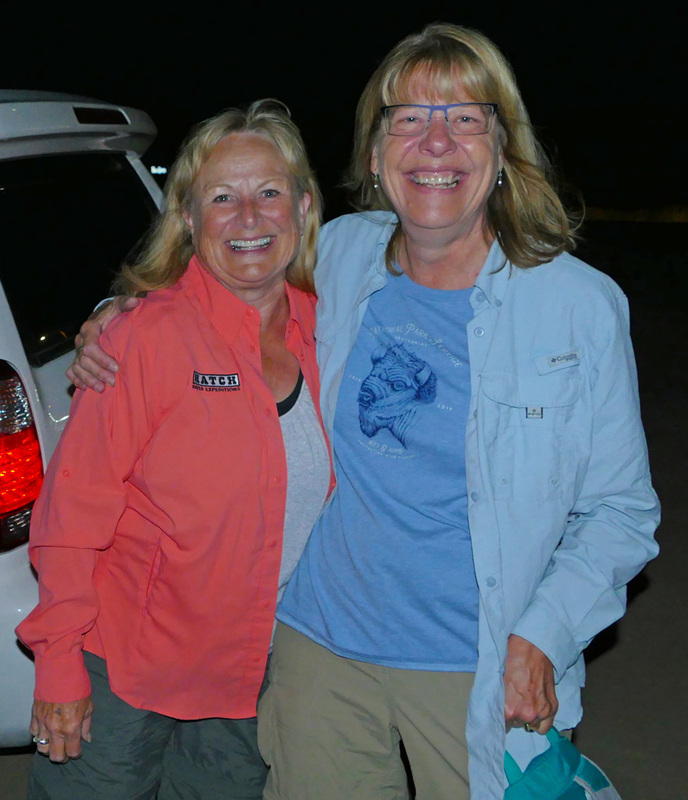 Gini and I will carry 4 cans of beer each in our daypacks…we can’t leave it behind! We get on the trail at 10 AM and start off ahead of the horses. The beargrass is just finishing and the nubby stalks are everywhere. Other wildflowers are in profusion, yellow, white, lavender. What a beautiful area! As we begin down the trail. 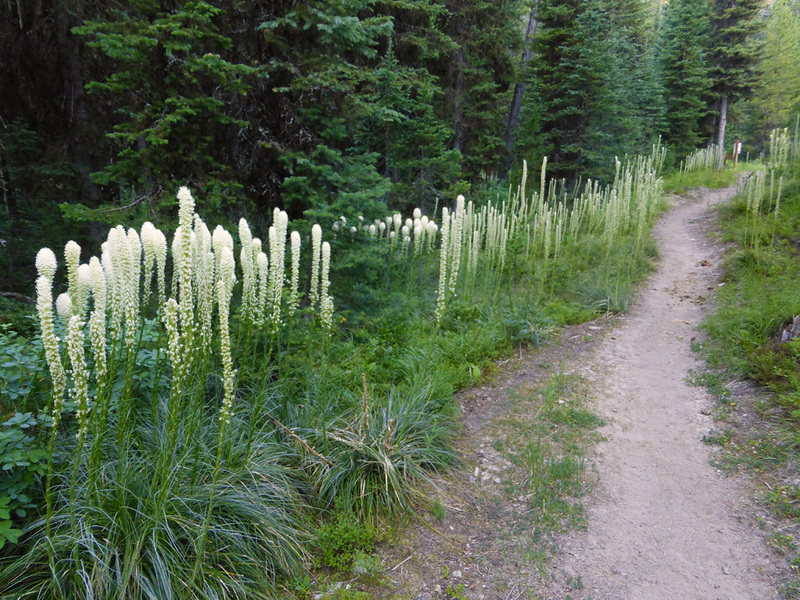 The beargrass have bloomed and this is the tail end of it. Beargrass is unique to western North America and each “colony” of beargrass only blooms every 5-7 years. This summer was a bumper year for beargrass. We get to our first river crossing. I remove my boots to wade across in water sandals. Gini braves the river but has wet feet for it. Of course, the day is getting warm and she may enjoy having cooler toes. Putting my dusty boots back on after crossing a fairly substantial stream. Our wonderful volunteer packer, Matt Farwell, and his trusty sidekicks. 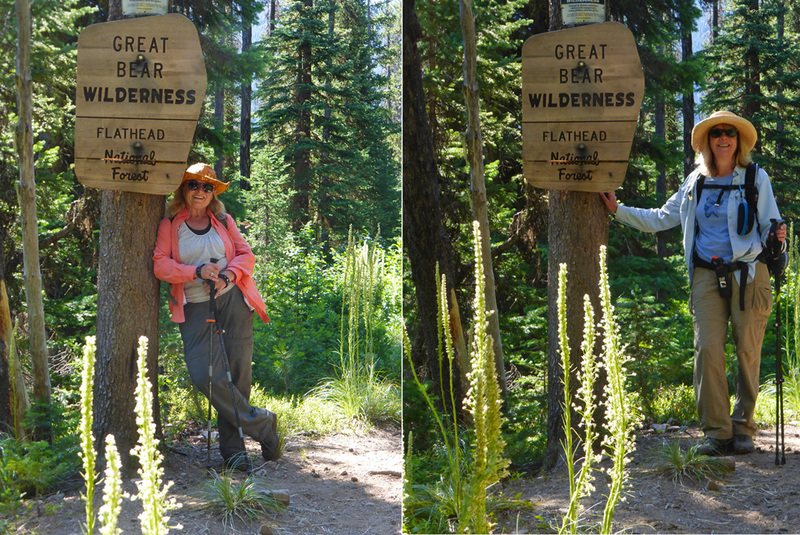 We cross over into the Great Bear Wilderness, a trail sign marks the spot. We pause for photos. I know you’ve seen this shot before but it was so momentous for us to have finally reached this point. 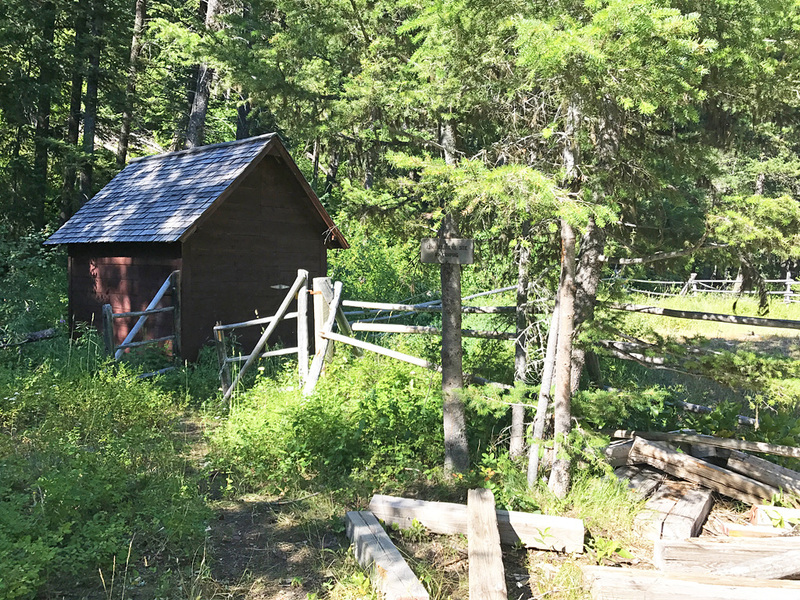 It felt like this was the starting point—we were entering the Great Bear Wilderness! The adventure is well under way. We have been walking through a series of small draws with running streams. 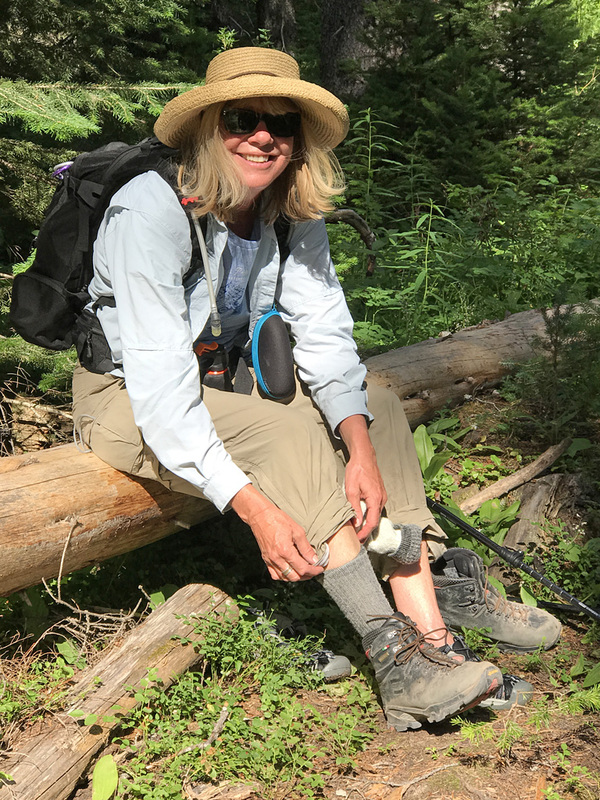 Many of these we can cross over on downed logs, others have rocks naturally placed for convenient hopping, still others are so shallow, the boots slosh right through. Those draws are thick with foliage and bright spots of flowers. 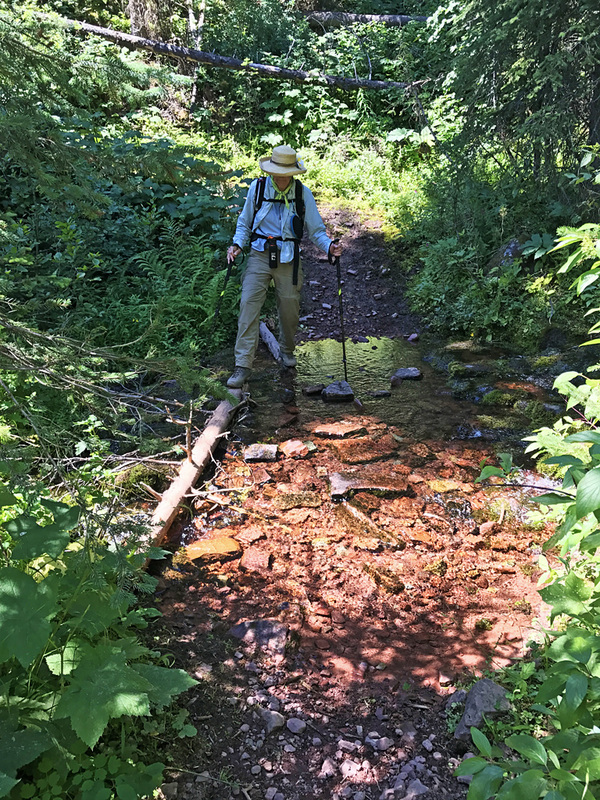 One of the many streams crossing over the trail. We come out of the cool forest into some burned areas with bare slopes and tall matchsticks for trees. There is a lot of scrub so the fire can’t have been very recent. Maybe a few years before. The day’s temperature is rising and we relish the cool shade as the trail continues into a massive canyon. We are walking around a mountain, up slopes and down into deep draws. We are slowly descending into the drainage of the middle fork of the Flathead River. We see the signs for many trails and one that leads toward Schafer Meadows. We are on a similar course but our destination is Granite Cabin, close to 7 miles from the trailhead. 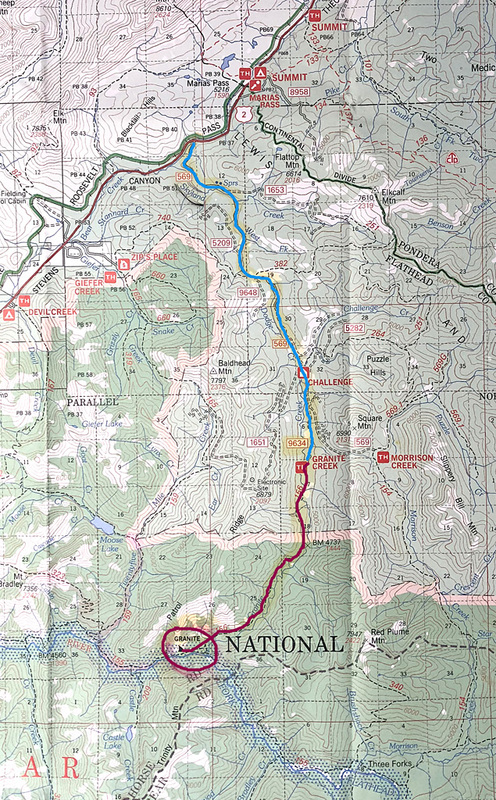 The map shows the drive to the trail head in blue, our hike is in red. To be continued next week…stay tuned! I am following this adventure. Jon took a pastel lesson from you earlier. Of course I remember you, Patty, and Jon too! I hope you are both doing well. Thanks for your interest in our adventure. This is great! Lindsey send this to me, and asked if I’m signed up for your blog. Signed out? How do you do this. Be well. Thanks for inviting us along on your journey….the easy armchair way! 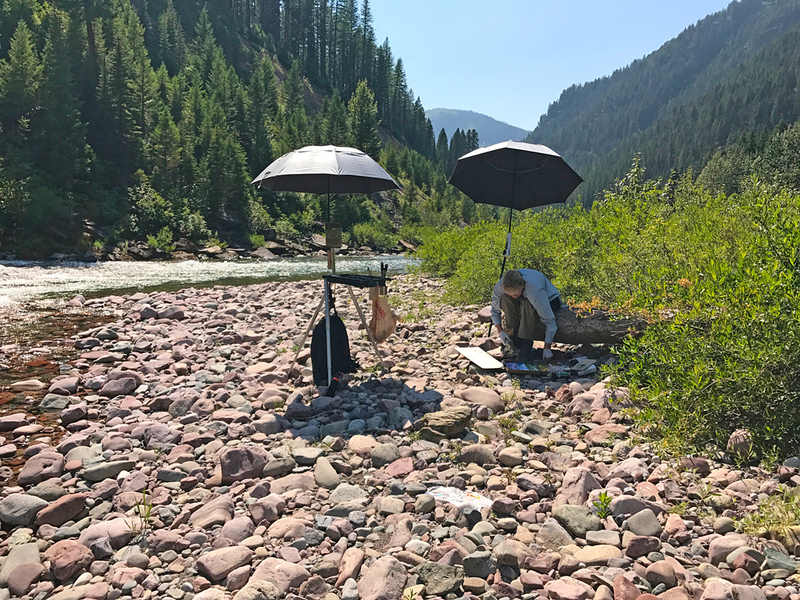 This is very exciting and what a great opportunity to paint the pristine wilderness. Way to go…I will be following! I am in Denver now and loving it! Hi Wendy! So great to hear from you. I wondered where you had gone as I haven’t seen you in so long. I’m glad you’re enjoying Denver and all is going well. Keep in touch!